THE HAGUE - The Forward Operating Location (FOL) Treaty between the Dutch Kingdom and the Government of the United States (US) under which the US carries out counter-narcotics operations at Curaçao’s Hato Airport and to a lesser extent at the Reina Beatrix Airport in Aruba has been extended by another five years. Dutch Minister of Foreign Affairs Bert Koenders, also on behalf of his colleague of Defence Jeanine Hennis-Plasschaert, informed the Second Chamber of the Dutch Parliament of the extension on Monday. The extension went into effect per November 2, 2016. This is the second time that the 2001 treaty was extended after the initial 10-year term. Accompanying the Minister’s letter were two annual evaluations of the FOL Treaty covering the periods October 2014 to September 2015 and October 2015 to September 2016. It regards reports about the efficiency and the effects of the treaty that regulates the cooperation between the Kingdom and the US to access and use the facilities in Curaçao and Aruba for counter-narcotics operations by air. It concerns surveillance, monitoring and detection of narcotics transports. The flights are carried out unarmed. In the period October 2015-September 2016, a total of 939 flights were carried out 479 missions by the US 12th Air Force (AFSOUTH) and 460 by the Joint Inter-Agency Task Force South (JIATF-S). All flights took place from Hato Airport. The Aruba airport was not used in this period. The total number of flight hours was 6,257. The flights contributed to the total seizing of 282,000 kilogram cocaine, 33,179 kilogram marijuana and 20 kilogram heroin. According to the report, the Kingdom benefits from the US air reconnaissance based on which narcotics transports are detected and seized. On many occasions the Royal Dutch Navy is involved in seizing the drugs at sea. The US authorities keep the Commander of the Dutch Navy in the Caribbean abreast of the number and types of the flights as well as operational details of the flights that are carried out from the FOLs. The Dutch Commander is also informed when so-called host nation riders are on the flights. These observers have to be on flights that transgress borders of third countries. Besides representing their country, these observers also provide information on the area that the aircraft passes. In total, there were 59 missions, all above Colombian territory. The host nation riders consequently were all from Colombia. Some 11 U.S. military personnel are permanently assigned for periods up to one year. These are personnel who fulfil key roles within the FOLs. Approximately 100 US military personnel are temporarily assigned for periods from about two weeks to six months. Their roles range from aircrew who conduct aerial-counter-illicit-trafficking missions to logistics and maintenance personnel who support the FOL missions on the ground. Another 61 US citizens and 52 Dutch and Curaçao citizens provide contracted support to the FOLs. The FOL at Hato Airport is used to the max. However, Aruba is barely being used. 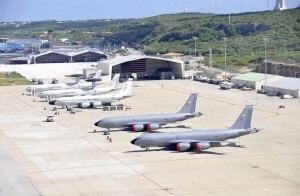 The Aruba and US Government are in consultation about the decrease of the FOL area at the Reina Beatrix Airport. The airport wants to expand its commercial area, which would result in a dual use of the 45,000m2 of the FOL area. Only 21,550m2 would remain exclusively for FOL use. The negotiations have not been concluded as yet. AirportThe HagueU.S. Forward Operating LocationU.S.A.